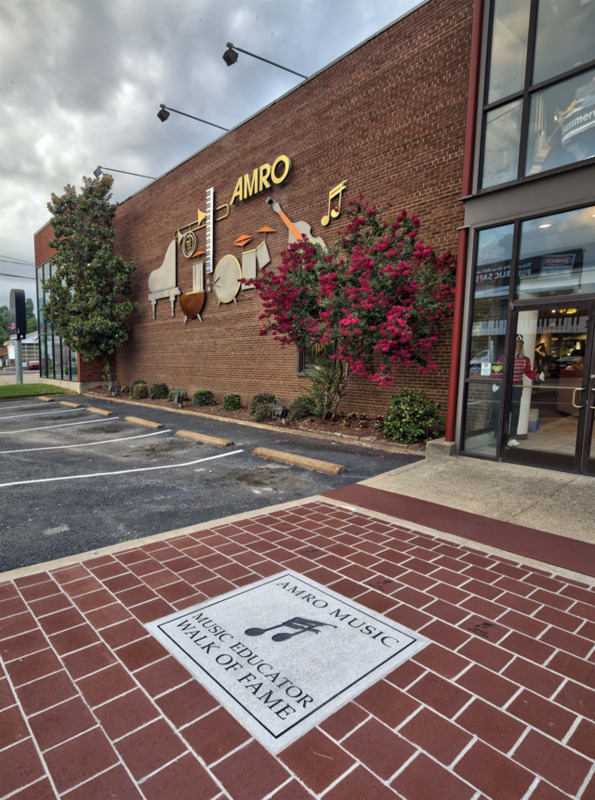 The Amro Music Educator Walk of Fame recognizes music educators who have had a powerful and exemplary impact on Mid-South music students. The names of those elected to the Walk of Fame are engraved in the bricks at the entrance to Amro. The primary criterion for election to the Amro Music Educator Walk of Fame is influence on music students, manifest not just in outstanding musical abilities but in life skills and citizenship, accompanied by a strong appreciation of music, music making, and music education. Such influence is illustrated by the respect and appreciation of students and their application of the life lessons and guidance provided. Students deciding to pursue music education as a career are often excellent indicators, as a student choosing to do with his/her life what the teacher has done with his/hers is often the ultimate approval rating. The music education provided can be at any age or level, on any musical instrument, in any style of music, and for any format of education (e.g., private teaching, public education, administration). Educators elected to the Walk of Fame so far include David Willson, Dr. J. D. Kelly, and Jim Holcomb. Nominations are made by the public and can be made at any time. Nominations that are not selected immediately are held for future consideration. Multiple nominations are appreciated but selection is not made according to the number of nominations but on the influence of the music educator; in the case of multiple nominations all examples of influence will be consolidated for consideration. Help us recognize those outstanding music educators who are so important to our children and the future of music. Nominate the music teacher who most influenced your life. Your nomination doesn't need to be formal, but your example of his or her influence will be valued and appreciated.